The history of the Pioneer Detroit Polanders is emblazoned with the name of Dominic Hippolytus Kolasiñski. In 1882, he became the fifth pastor of St. Albertus Parish. A very charming and capable man, he proved to be both a very charismatic priest and a very controversial leader. 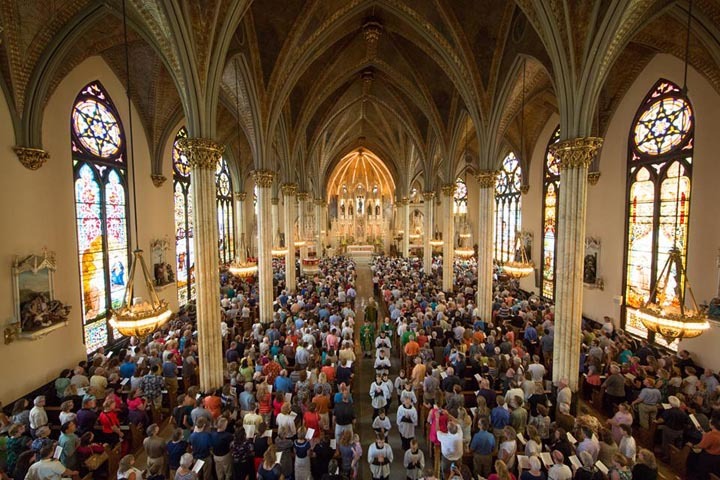 He rallied his people to build the present beautiful Gothic Church of St. Albertus which was dedicated on July 4, 1885. Unfortunately, late in November of 1885, trouble and dissension polarized the parish into two factions. Father Kolasiñski was the center of contention. He was removed from his pastorate and suspended from the priesthood on November 30, 1885, for a variety of alleged reasons. Riots and disturbances and mayhem followed. Young John Lewicki, 24, was killed in one such riot on Christmas Day of 1885. Father Kolasiñski’s adherents would not allow him to leave. Moreover, after consulting a competent canonist, he wrote a letter to Bishop Casper Henry Borgess on December 30, 1885, in which he lamented the latter’s lack of canonical procedure. First, he had not been presented with a document of detailed specific charges made against him. Second, he had not at any time previously received the two requisite warnings concerning any of his alleged irregularities. And third, he was denied due process to protect his person with proper legal representation. That is why he felt his suspension was issued illicitly and invalidly. He felt no man is above the law and that his bishop must follow Canon Law. He rationalized that if bishops fail to observe rules and regulations, then priests and laity are not required to accept disciplines which contradict the general laws of the Church. That is why he initially refused to leave his pastorate. It was only in early April of 1886, after a judgment of the civil court on March 19, 1886, rendered a verdict in his disfavor, that the priest left Detroit for the Dakota Territory. Here he became pastor of a rural Polish parish of Poznanian and Kashubian farmers near Minto. In the meantime, Father Kolasiñski’s followers in Detroit, who consistently claimed that he had been unfairly removed and without due process, formed their own parochial community. Already in August of 1886, they had established a school for their children. This was realty the unofficial genesis of Sweetest Heart of Mary Parish. This was the beginning of a community known affectionately in the heyday of the Detroit Polonia as “Sercowo” (The Heart’s Area). When John Samuel Foley was installed as the new bishop of Detroit on November 24, 1888, Father Kolasiñski returned to the city on December 8, 1888. It was his hope that his case would be reviewed by the new bishop and that a judgment favorable to his person would be rendered. This did not happen. That is why he officially began the Parish of the Sweetest Heart of Mary outside the jurisdiction of the Catholic Church of Detroit. On February 11, 1889, he incorporated it under the title of the Sacred Heart of Mary Parish. Shortly afterwards he began the construction of a church-school building on Canfield Avenue which still stands today behind the church edifice. During the years when the church was being built (1890-1893), Father Kolasinski made overtures to have his irregular status rectified. In this effort he was successful. After an investigation by the first Apostolic Delegate to the United States, Archbishop Francesco Satolli, Rome ordered Bishop Foley to make peace with Father Kolasiñski and his gigantic parish of some 4,000 families. On February 18, 1894, in a memorable ceremony, he and his congregation were officially received into the Diocese of Detroit. Interestingly enough, however, the parish properties uniquely remained under the control of its own Board of Trustees. The 1890s were difficult years. A ruinous depression ravaged the nation. The new church which cost $125,000 — a very considerable sum of money in those days — was heavily in debt. In 1891, it was sold at auction for $30,000. After protesting this injustice to the courts and after securing a loan through the Montreal branch of the Bank of England for $65,000, the parish “repurchased” its own church for $45,000. To do this, many families mortgaged their simple neat homes which they built in the very shadow of this tremendous edifice. Such was their devotion to their parish!